Levi is the biggest ski resort in Finland and Lapland’s most popular resort. The season usually starts at the end of October and lasts all the way through until mid-May. 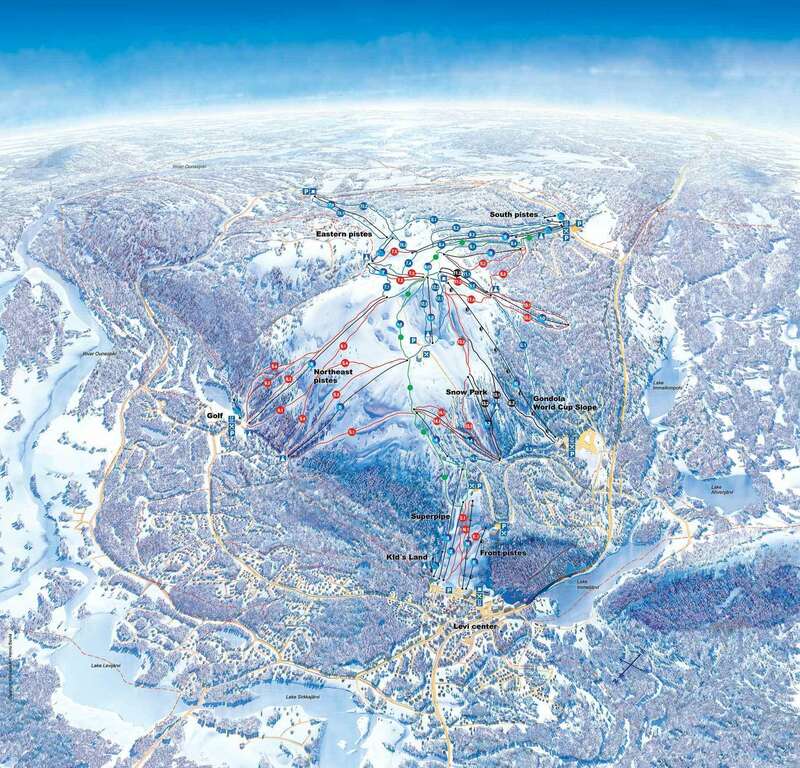 In recent years, the resort has developed its ski lift system and town to a high standard and now boasts a slope-side village, excellent restaurants and Finland’s largest snow park and ski area. This authentic winter wonderland offers breath-taking scenery all year round. The stunning snow-capped trees and glistening frozen lakes present a captivating picturesque resort that you’ll instantly fall in love with. There are around 40 restaurants in the village that cater for a wide variety of tastes, as well as a number of cafes, bakery’s and mountain stops. There is a lively après ski scene in Levi with a number of pubs and clubs to explore including a sports bar, Irish bar, Karaoke bar and many more. Levi has 27 ski lifts, including the new Levi South 6 seater chair with heated seats that serves the South ski area. The Levi ski area is regarded as the most extensive in Finland and offers 230 km of cross country skiing, 886 km of snowmobile routes and 20 km of winter walking routes, as well as the 43 ski runs. Levi is best suited to beginner and intermediate skiers. It is an ideal resort to learn to ski with its uncrowded slopes, small classes and English speaking instructors. There is a selection of self-catered chalets and half board hotels available for ski holidays in Levi. All are in walkable distance to the slopes allowing maximum mountain time on your ski break. Our favourite hotel in Levi is Hotel Crazy Reindeer. Northern Lights excursions by horse drawn sleigh or husky sleds. Overnight stay in a luxury glass igloo – Just a 15 minute drive away, this unique trip is the perfect way to observe the Northern lights from the comfort of your own bed. Premium and Superior options are available. Lainio SnowHotel visit - The 3 hour trip includes a scenic evening coach and a guided tour around the famous Snow Village with it’s amazing ice sculptures, SnowHotel suites, ice bar, ice restaurant and more! Snowmobile safaris – 2 hours excursion starting from in the resort. Enjoy a 28 km ride through the stunning scenery. The safari is available during the day as a family friendly trip or in the evening ‘In Search of the Northern Lights.’ Longer trips can be booked in resort. Husky safaris – Visit the local husky farm and enjoy a rememberable husky sleigh ride. There are lots of options, starting from a Husky Mini Safari with a 2km sleigh ride and 1 and a half hours in total at the farm up to a Husky Half Day safari with a 15km safari and 3 hours in total at the farm. Northern Lights Husky Safari – This 3 hour safari includes a 10km sled ride under the night sky in search of the Northern Lights. The sleds are driven by the guide and the price includes a drink and snacks at the Kammi hut after. Reindeer Safari and Sámi reindeer farm visit – Just a 15 mins drive away is the local Sámi reindeer farm. Spend 1 and half hours at the farm feeding and learning about the reindeer before a scenic sleigh ride and a hot drink and cake at the end of the visit. Horse riding Safari – 2 and half hour excursion including over 1 hour on the horse. Northern Lights Horse-drawn sleigh ride – 1 and half hours excursion including 20-30 minutes on the sleigh ride through the snowy landscape in search of the Northern Lights. Ice Karting competition – 2 hour excursion. Just 10 mins drive away; you can enjoy a fun day driving around this easy-to-drive Ice Kart on a snow packed track. Santa’s Secret Home excursion with private Santa visit for every child – Just 15 mins drive away is the magical home of Santa, nestled away in a snowy magical forest. Visit Santa and his reindeers plus many other activities during this 2 and a half hours excursion. Absolutely fell in love with Finland and the people. A bit on the expensive side but snow is unbelievable, why travel all the way to Canada when the snow here is just as good! I will definitely go back. Not very good for expert skiers but beginners and intermediates will love it! Levi has the best facilities and the only gondola in Finland. Skiing and boarding can be done starting in October until May. The amount of slopes can not be compared to any resort in the alps but they will keep you busy for a couple of days and the Finns sure do know how the build a fun park. Levi is so much more than just a ski resort, there are loads of activities to be done. The main touristic activities are snowmobiling, husky & reindeer safaris or ice fishing. You can even do a day trip to have a day cruise on a icebreaker ship. Finnish people are generally know as quiet people, that all changes when you see them partying at the Levis apre ski club Crazy Reindeer.